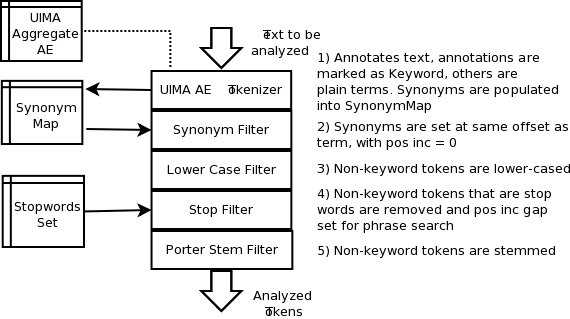 Last week, I wrote about a UIMA Aggregate Analysis Engine (AE) that annotates keywords in a body of text, optionally inserting synonyms, using a combination of pattern matching and dictionary lookups. The idea is that this analysis will be done on text on its way into a Lucene index. So this week, I describe the Lucene Analyzer chain that I built around the AE I described last week. A picture is worth a thousand words, so here is one that shows what I am (or will be soon, in much greater detail) talking about. As you can imagine, most of the work happens in the UimaAETokenizer. The tokenizer is a buffering (non-streaming) Tokenizer, ie, the entire text is read from the Reader and analyzed by the UIMA AE, then individual tokens returned on successive calls to its incrementToken() method. I decided to use the new (to me) AttributeSource.State object to keep track of the tokenizer's state between calls to incrementToken() (found out about it by grokking through the Synonym filter example in the LIA2 book). After (UIMA) analysis, the annotated tokens are marked as Keyword, any transformed values for the annotation are set into the SynonymMap (for use by the synonym filter, next in the chain). Text that is not annotated are split up (by punctuation and whitespace) and returned as plain Lucene Term (or CharTerm since Lucene 3.x) tokens. Here is the code for the Tokenizer class. // verify if the range has not already been recognized. The next filter in the chain is the (Lucene provided, since 3.0 I think) SynonymFilter. It needs a reference to a SynonymMap. 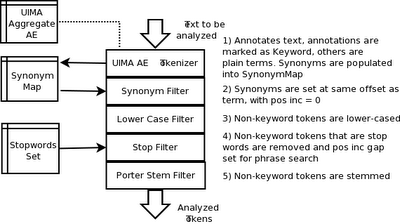 An empty SynonymMap was provided to the UimaAETokenizer, which it populated, and now it is available for use by the SynonymFilter. And yes, I do realize that this sort of pass-by-reference stuff is frowned upon in the Java world, but at least in this case, it keeps the code simple and easy to understand. At the end of this step, the SynonymFilter will set the synonym terms at the same offset as the original term, and set the position increment gap to 0. The next two filters are the LowerCaseFilter and StopFilter, to lowercase the tokens and remove stopwords respectively. I wanted them to not operate on tokens generated off the UIMA annotations in my UimaAETokenizer, similar to how the PorterStemFilter operates on Lucene 4.0. Specifically, with PorterStemFilter, it is possible to mark certain terms as keywords using KeywordAttribute.setKeyword(true), and these terms will be skipped for stemming. However, this functionality does not exist in Lucene (yet), so I have opened a JIRA (LUCENE-3236) with the necessary patches for this, hopefully it will be incorporated into Lucene at some point. In the interim, you can use the versions below, which are functionality-wise identical to the patched versions I provided in the JIRA. * Extra constructor to trigger new keyword-aware behavior. The only real change is an extra constructor to trigger keyword-aware behavior, the addition of the KeywordAttribute (so this filter is now keyword aware) and a little if condition in the incrementToken() method to short circuit the lowercasing in case the term is marked as a keyword. Similarly, the StopFilter below is also almost identical to the stock Lucene StopFilter. Like the custom version of the LowerCaseFilter, the only changes are the extra constructor (to trigger keyword-aware behavior), the addition of a KeywordAttribute to its list of recognized attributes and an extra condition in the (protected) accept() method. * New ctor to trigger keyword-aware behavior. this.stopWords = stopWords instanceof CharArraySet ? * Old ctor for current behavior. And finally, my analyzer contains the PorterStemFilter, which already recognizes keywords, so no changes needed there. To test this analyzer, I wrote a little JUnit test that takes the snippets of text that I used to test my UIMA AEs before. The output (edited for readability) of the test shows that the analyzer works as expected. You can see the effects of each of the filters in our analyzer in the different examples below. input=CSC and IBM are Fortune 500 companies. input=Unstructured Information Management Application (UIMA) is fantastic! input=He is a free-wheeling kind of guy. input=Get your daily dose of Vitamin A here! So anyway, thats about it for today. This information is probably not all that useful unless you are trying to do something along similar lines, but hopefully it was interesting :-). Next week, I hope to incorporate this analyzer into Neo4J's Lucene based IndexService (for looking up nodes in a graph). Could you share "tgni.uima.utils.UimaUtil" ? Hi Cem, thanks for the kind words. I have added the UimaUtils class to my post. Currently I am working with a local git repository - this is a skunkworks project I am doing on my own time that attempts to solve a problem at work. When complete, I plan on giving my company first dibs on the project, if they don't want it then I will open-source it - so currently there is no public repo for this code.